Though women constitute at least half of the world's population, their representation in political system is not in commensurate with the proportion of their numbers. Even many advanced countries like US and UK have less number of women when men in Senate and Parliament. Mexico is leading the way in giving women to have more say in politics. Until the 20th century, Mexico had been primarily a rural country and women were confined to rural family and community. But, with the Spanish conquest of the 'Aztec' empire, cities began to develop and women began to come out of their rural life. They made great strides towards more equitable legal and social status. In 1953, Mexican women were granted to vote in national elections (en.m.wikipedia). But, by and large, they are still exploited and discriminated in most parts of the country. Women represent 52% of Mexico population but it ranked 49 out of 190 countries in the percentage of women in executive and ministerial positions (“Political representation of women in Mexico”, April 10 2015, by Juanita Islas, www.wilsoncenter.org). In Congress, women occupy 37% of seats, which was 24% ten years ago. 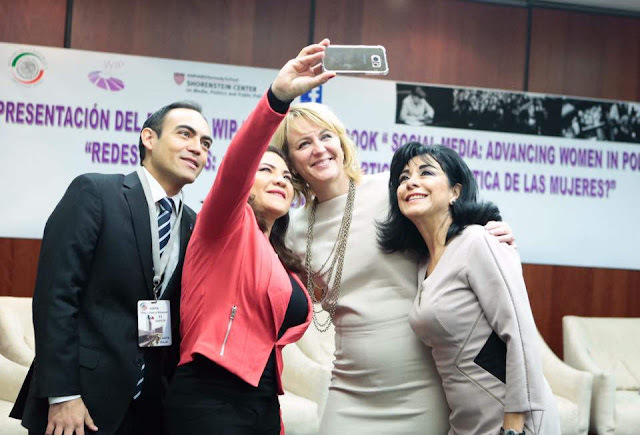 In 2014, the country passed a political reforms law stipulating that at least fifty percent of the candidates fielded in federal ir state election must be female (“Mexico seeks to Empower Women in Politics”, July 10, 2014, wilsoncenter.org). Women account for 38% of legislators in the lower house and 35% of Senators. In US, women occupied only 18% of seats in the House of Representatives and 20% of Senators are filled by women. Quota of 50% must be maintained by political parties and replacement for women candidates must be women only. Affirmative action taken by Mexico government has made progress of women in politics possible in a big way. After July 1 elections, in the next Congress, women will make up 47.8% of lower house and 49.2% of senate and at least 50% of most state legislatures. (“Mexico's election was a breakthrough for women”, axios.com). The lower house will have world's fourth largest female representation. Senate will have world's second largest female member representation after Belgium. It will be the only country with an elected senate having women majority (“Women Win Big in Mexico' s Elections”, Lauren Gilger, July 13, 2018, kjzz.org). The country not only has a left - leaning president but Mexico city will have a woman mayor for the first time in the history of the nation. Other nations, including India, should learn from Mexico the ways of empowerment of women. The 33% women's quota bill in India is yet to be passed. No political party is interested in giving compulsory quota to women. Mexico has taken a significant step in this direction. According to an article in the “Washington Post” (“Women won big in Mexico's elections taking nearly half the legislature seats ...” July11,2018), Magda Hinojosa and Jennifer M Piscopo state that women's wins are the result of 15 years of electoral reforms, in which Mexico incrementally refined the affirmative action rules that compel political parties to nominate women. Analysing the impact of imposing reservations for women, the writers argue that gender parity is possible mainly through quotas and women have the same credentials as men and are even better qualified. They care more about rights issues and social problems more than men. Even women of rightist parties are more progressive than men. Over 75 countries have some form of quota for women in politics. All Latin American nations except Guatemala and Venezuela have laws regarding political reservations for women. Mexico is leading the way: Will other developing countries of Asia and Africa follow its footsteps?